As part of the Level 1 of the DIY Income Investor 'Income Pyramid' I encourage people to pay off their mortgages before embarking on 'serious' investing. Not everyone agrees, so I thought I should set out the five most convincing reasons I can come up with to justify this position. My interest in owning property is to have somewhere to live rent-free, in order to minimise my living expenses - giving me an added degree of financial freedom. Under some circumstances it is possible to make a case for renting rather than buying but I have never found that particularly convincing. I should also state that I have never been interested in property as a source of income - although some people obviously are able to manage property rentals quite successfully. To me, this has always seemed a hard way to make money. And recent events in the housing market almost everywhere have confirmed to me that property capital values are not to be relied on. So, with those provisos, here are my five top reasons to paying off your mortgage. Your mortgage is probably the largest debt you have (and will ever have); if you can deal successfully with the mortgage, you are unlikely to have a problem with credit card or other debt. It's all about financial discipline and patience. It's not easy - but that's the first lesson of financial management. Finding the money to pay down your mortgage will force you to think about how to reduce you day-to-day expenditure. The lower your on-going expenditure, the lower your target for passive income. The main objective of the DIY Income Investor is to achieve financial freedom by generating a substantial passive income. 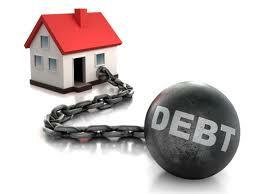 Trying to do that with a mortgage (or any big debt) is like trying to walk with a ball and chain on your foot. Once you have somewhere to live that you own, you have made a big step towards the larger objective. Normally, the interest rate you pay on your mortgage is more than the yield you would obtain on a savings account or 'safe' investment. And remember the tax that you are paying on the money that you are using for your mortgage payments (compared with the tax-free interest that you could be making from savings and investments or the tax you could save in a pension). So, by paying off the mortgage as quickly as possible you reduce your net expenditure on mortgage interest (and tax). There are some situations where the interest you are paying may be less than the return on savings or 'safe' investment. But such situations have to be temporary - after all, how can any lending organisation consistently charge your less than they have to pay for the money? If your mortgage interest rate is unusually low now, doesn't that give more headroom to start paying it off? I think most people who have paid off their mortgage will remember with a smile the day that they made the last payment. After years of struggle they have achieved something very tangible and substantial. And then they can roll up their sleeves to work on the larger task of developing their passive income through DIY Income Investing. For more on this, see the Monevator's interesting article on both sides of the argument as well as Canadian Couch Potato's defence of not paying it off. Does anyone remember MIRAS in the UK. That used to skew the arguments considerably. Although I was a 'loser' when MIRAS ended (by a Conservative government ! ), I'm still glad that it is no longer ramping up house prices along with everything else. I think there is a version of MIRAS in the USA - which always surprises me. I currently live with my parents and pay then $75 per week rather than rent or buy a house as I think it is cheaper. Renting would cost about $300 per week or more. Buying would cost more. Even though you get a house after you pay off the mortgage, the fact that you pay interest means that you are roughly as worse off if you buy a house compared to if you rent. The value of the asset (property) should - in the long run - keep up with inflation. The opportunity is to pay off debt now while interest rates are low (and you have spare cash). @Anonymous Yes, I expect many readers will be in your position ('renting' at home). That can make sense, as can renting. Although at some stage you may want to move out and start a family. Don't forget that the value of the house or apartment that you buy will eventually rise with inflation (when the housing market crisis has worked itself out) - the main advantage of buying rather than renting. Behind the argument for not paying off your mortgage is the reasoning that you could invest the extra money and earn a higher return, while keeping your money more liquid. That may have been a good reason in the past but the rate of return on investing now is more questionable, compared to the fact that every dollar paid to reduce a mortgage balance provides a guaranteed return equal to the interest rate on the mortgage. You should pay your debts because the interest for the debt is larger in time over the price of the house which loses some value in time.